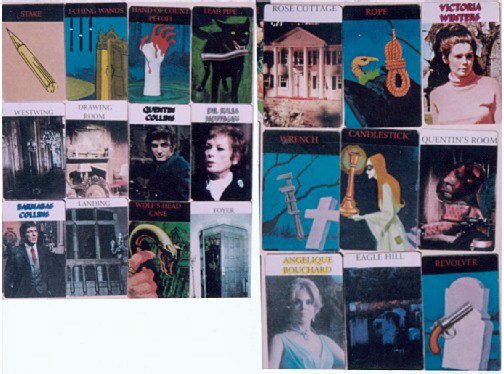 Below are some pictures of my Dark Shadows version of the board game Clue. You can see some of the corresponding Room, Weapon and Suspect cards. The Westwing, Quentin's Room, Eagle Hill, The Mausoleum, The Drawing Room, The Foyer, The Landing, Rose Cottage and The Old House. The Hand of Count Petofi, A Stake, Nightshade, I-Ching Wands, a Voodoo Doll and a Wolf's Head Cane!. Barnabas Collins, Nicholas Blair, Prof. Stokes, Quentin Collins, Angelique Bouchard, Victoria Winters, Dr.Julia Hoffman and Carolyn Stoddard. As you can see from the pictures I have added another dimension, in that each player has a "stand up" of the character they are representing. Each player also has a color co-ordinated score sheet based on the color associated with their respective character.